Oh Valentine’s Day! What better way to celebrate than to mate your plants in a match bound for glory? That’s just the idea in the new Quirk Books release – Soil Mates: Companion Plants for Your Vegetable Garden – a visual cutie of a book with lots of good gardening advice besides. 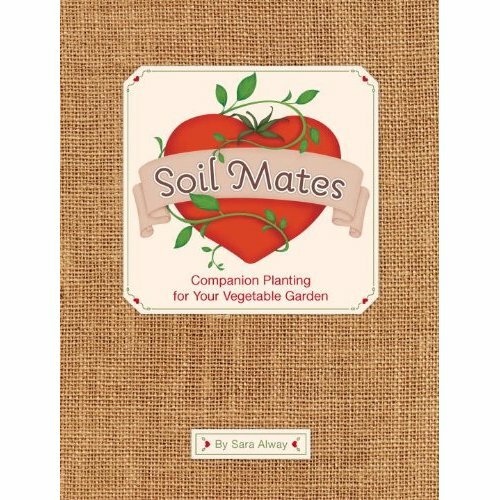 Soil Mates is an easy entry to the world of companion planting – a style of gardening that pairs certain combinations of veggies, herbs and flowers together for increased yields and pest resistance. Included here are twenty pairings described in detail, along with recipes that use the paired veggies as main ingredients *and* advice on seed starting, natural pest resistance, container gardening and planting timelines. Useful as all that is, what really makes this book for me is its style and design appeal. Written like a matchmaking guide to plants (with sections including turn-ons, turn-offs, love triangles, stalker alert and foreplay), Sara Alway gets away from the dry language found in many garden how-tos. The illustrations are bright and inviting and include helpful visuals for plant placement and spacing – and overall this is a visually appealing book in the hand or on the shelf. This is definitely something I would give to a new or burgeoning gardener as a stocking stuffer (or a Valentine’s Day gift) for something fun and informative (even a little romantic – gotta watch those veggie pairings before they run off and elope after all). How fantastic! I never even thought of this before! I am grateful I found you today via Facebook’s post-a-day!